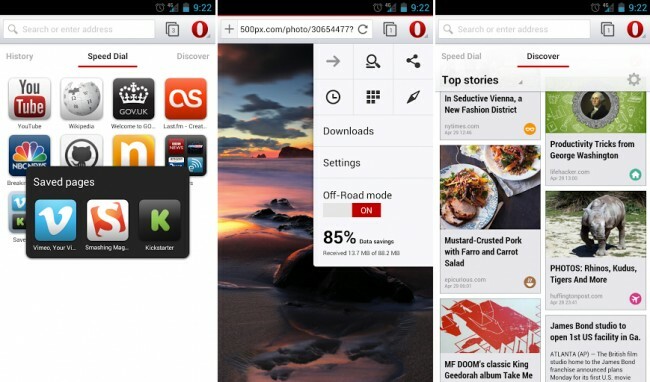 If you checked out the beta of the complete Opera browser app back in March and want to see the progress that was made, you can now try the complete real deal. Released this morning to Google Play, Opera brings a full-web experience, complete with custom features that make browsing the web painless and quick. The browser features two very unique features, among many others. The first one is Speed Dial, basically a bookmarks page, but it gives the pages the look of apps. You can place pages in folders for easy access to multiple categories. The second feature is Off-Road mode. With this enabled, users are able to browse the web at high speeds even without a good mobile data connection. For people who can’t stand page loads, this is something to check out. You can grab it for free right through Google Play.